I’m calling out all my fellow English nerds and residents of Minnesota. If you fall into either of those categories, your two cents may be required on this post. Have you ever noticed how some Minnesotans just leave words off at the end of their sentences? Especially pronouns. It’s like they just decide they’re tired of talking. It irritates me. And what irritates me most is that I can never seem to discern which of us is mistaken in our understanding of the English language. 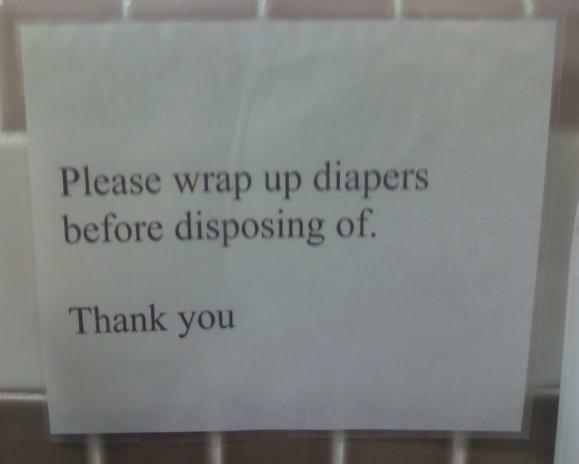 This was posted in the women’s restroom of Kids With Abilities in Shoreview. Really? Are you really confident enough in your pronoun dropping to print it out, laminate it, and post it on the wall? Can anyone solve this grammatical conundrum? …same thing goes on down in the Dominican Republic! Miss Katie, you are so very brave to continue to endure this strange land you have been called to. I hate to break it to you but the dangling preposition is just a main stay of speaking Minnesotan. The ‘come with’ and ‘go with’ congegations are the most common. If it’s clear (or fairly clear) what that final word (pronoun) would be, it’s perfectly fine to leave it off. I suggest you ask someone who actually speaks Norwegian or Swedish if it’s a product of direct translation. I know that a ton of strange Kenyan English is due to directly translating from Swahili. And I could write pages about that. :) Bless you! This one is dropping something, is it a pronoun? people get upset when you end sentences like this. This sounds acceptable, but still is a sentence fragment. I’ve never noticed this phenomenon. And I’ve lived in MN as long as I can remember. And I love language.